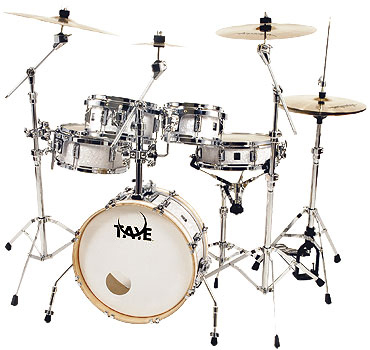 Taye is an interesting company, with a host of technical innovations and an unusual aspect I just found out the other day; They make every part of their drum kits themselves, in house. Even the heads are made in their own factory. I’m no expert in drum manufacturing procedures, but I’m fairly sure this is unique to them. Some ten years ago, maybe more, Taye’s GoKit first caught my attention. I got the impression it was a different, rather unique and more of an up-scale offering than most of the portable drum kits available at the time. As it turns out, my first impression was correct. 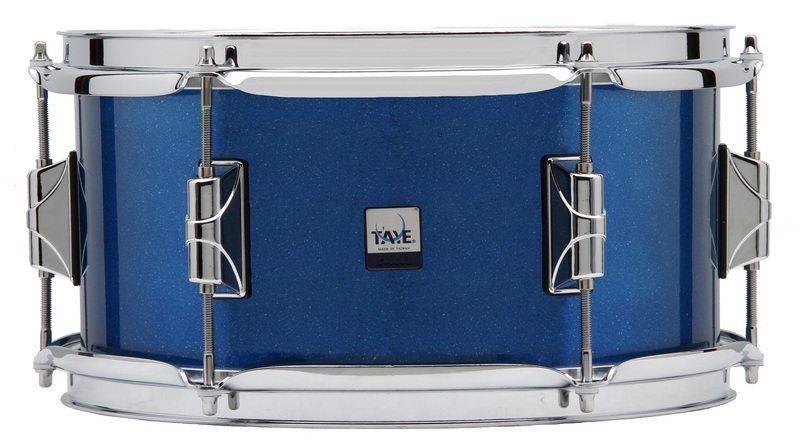 Finding out what an unusual organization Taye is, somehow sheds light on how come the GoKit is such an interesting drum kit. 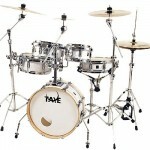 In this “In Depth Taye GoKit Review”, I aim to thoroughly examine every detail of this interesting drum kit. From quality, fit, finish and tolerances to value, portability and practical usefulness. For good measure we’ll throw in some comparisons with other kits in the same genre and provide a final, “Official CompactDrums.com Verdict“. Our Taye GoKit in Daytona Sunset, with hardware pack came in three boxes. The longer, heavier one obviously contains the Hardware Pack. 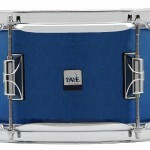 One smaller box was clearly marked with the three tom sizes, the other was marked Bass and Snare along with the sizes. The box with the toms looked pretty beaten up and partially squished which concerned me a bit. However the abundance of packaging material kept the toms safer than a passenger in a Volvo. Eager to have a look at the actual drums, the toms got unpacked first. They come out of the box completely assembled and pre-tuned. I hold the little 8″ in my hands, turn it around to get a good look from all angles and give the batter head a little tap with my finger. The Daytona Sunset finish is incredibly nice. Flawless even. Like a mirror. The chrome is equally impressive. The “Dynaton” heads are tuned rather low from the factory. To my surprise, the low tuning doesn’t stop it from singing and ringing out from a flick at the head. 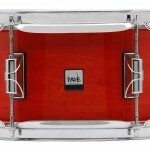 The other box contained the snare nested inside the bass drum. The only drum not pre-assembled. As with the 8″ tom, they were all tuned a bit low for my preference, but still resonate with sustain that defies the small sizes. 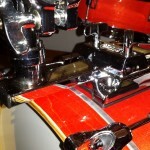 All shells are equally perfect in finish as is the now unpacked tom mounting hardware. 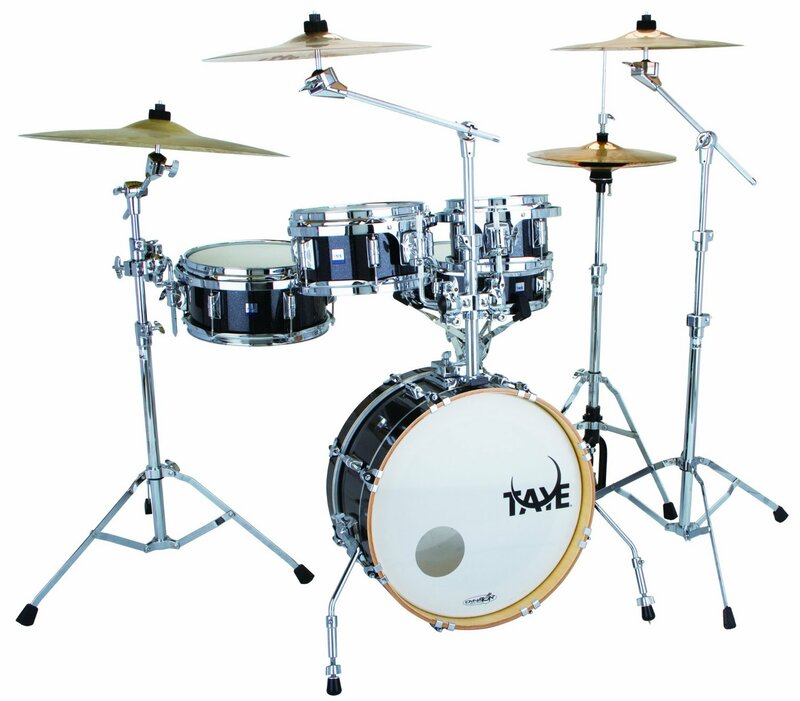 The hardware pack revealed two single-braced lightweight boom cymbal stands, a ball-and-socket, single braced snare stand, bass pedal, adjustable tension, single braced hi-hat stand and an additional boom arm. Although single-braced, the hardware seems sturdy and rigid while not too heavy. Every item in the hardware pack has at least one feature that set it apart from the norm. More on these features later. Experience has taught me to disassemble the individual drums and take all tolerance measures before setting the drum kit up for the first time. Reverse the order and there’s a good chance that measuring and inspecting gets “blown off”. 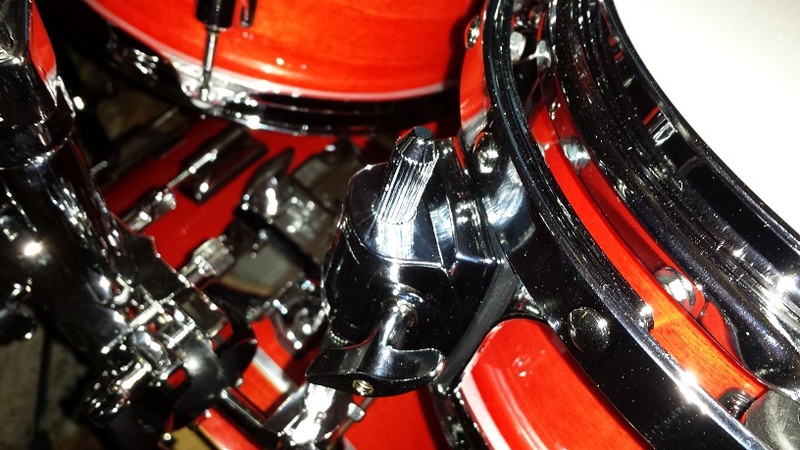 Throughout the kit the metal parts are all heavy gauge and with perfect chrome plating throughout. Threads, hinges and other moving parts are smooth and easy to adjust. The ball-and-socket joints are a bit stiff out of the box, but I suspect they will loosen up with a bit of use. All in all the shell hardware is top notch without so much as a slight imperfection to comment on. With all the heads removed the shells are subjected to a thorough inspection. Inside they are coated with a satin finish. If I had to nit-pick there is a wee bit of residual wood dust inside a couple of the shells and the inner ply seams on a couple of the drums are quite visible to the eye, but still completely smooth to the touch. This is however nit-picking to the extreme. The finish is impeccably flawless inside and out. The interior satin coat is completely uniform, smooth and 100% perfect. As is the mirror-like clear coat on the shell’s exterior. Throughout the kit I was unable to find a single finish flaw. Click on the “Daytona Sunset” image to the right under “Available finishes” and observe the perfect mirror like surface. Every section of every shell in the kit in front of me looks just like that! Tolerance measurements are equally impressive. 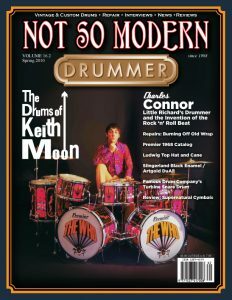 The only shell with measurable “Out-of-Round” was the bass drum at just under 1 mm while the snare and “floor tom” had slight “Out-of-Flat” measurements of under 0.5 mm. The rest of the shells are perfect with no measurable variances at all. These are about as perfect results as they get on serial produced drums and the best I’ve measured to date for the purpose of a review on CompactDrums.com. Bearing edges are 45 degree with a round-over throughout and are 100% perfect on both sides of every shell. They are all sanded smooth but not glossy, perfectly uniform and completely devoid of any cavities or variances. There does not appear to be any filler of any kind which also indicates high quality shells in general. Colour me impressed! The Taye GoKit gets 10/10 for Quality and Tolerances. For the reviewer, this may be the most enjoyable aspect of this Taye GoKit review. It seems Taye has found their own approach to most mounting, attaching and assembly designs throughout the kit. We’ll start at the bottom and work our way up. Folding spurs aren’t in themselves out of the ordinary, but Taye added telescoping extensions to their “Springflex™” spurs like those usually found on ratchet spurs allowing for added bass drum tilt or level positioning on uneven surfaces. The brackets the spurs attach to, like all the other mounting brackets on the kit are called “PocketHinge™” I haven’t disassembled one, but it looks like the inside half of the bracket “sleeve” is hinged on a tab. So the rod is held tight between two separate hinging halves without visible hinges on the outside. Brackets, lugs, and anything else mounted to the shells are fitted with sleeved isolation gaskets. 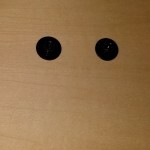 The screws pass through the sleeves, further reducing wood to metal contact compared with just flat gaskets. 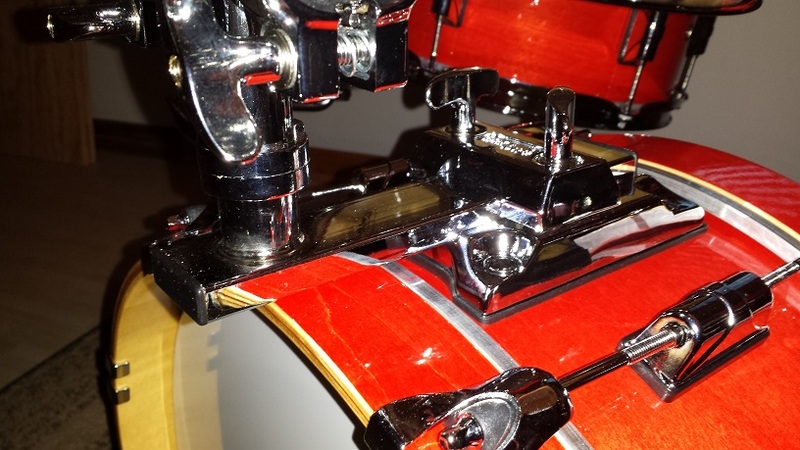 The “SlideTrack®” Tom mounting platform on the bass drum is fitted over the top of the shell. The post for the toms slides horizontally into the platform. 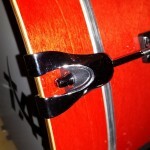 The result is a “virgin” bass drum without holes for the post to pass through. 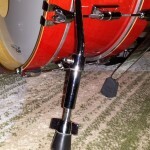 This also allows the tom post to slide some six or so inches back and forth which may be helpful for players with short, or long arms to position the toms just right. 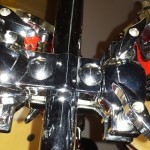 The ball joint L-rods aren’t fitted to the tom post, but are rather a separate assembly that clamp onto the post. 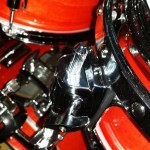 As is the single ball joint L-rod for the “floor tom”. This allows for flexible set up configurations. Simply switch the assemblies for a 1-up, 2-down config, or move the dual assembly to the left crash stand and the single assembly to the post, add a regular floor tom and you have 3-up, 1 down. 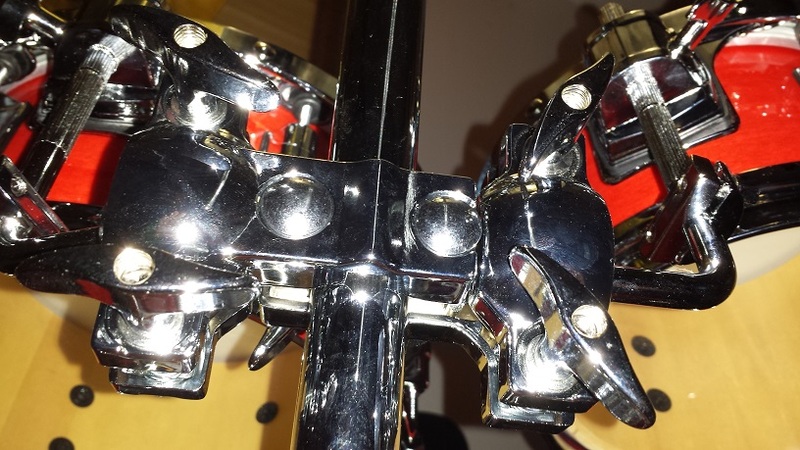 The bass drum claw hooks are kind of hinged on the tension rods. Taye calls them “Articulated Claw Hook™”. The advantage being that the head can be removed without unscrewing the T-rods all the way out. 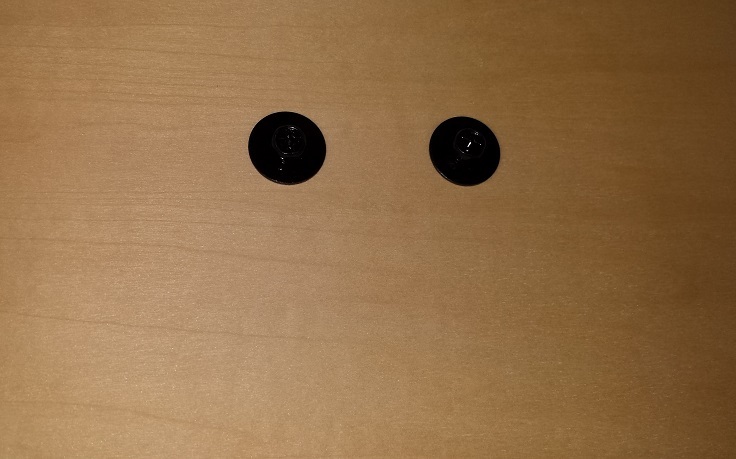 Simply unscrew them a few turns and flip the claw back and out of the way. 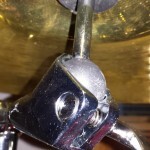 The snare drum strainer is about as simple as they come, which is a good thing as less moving parts usually means less problems. There are a lot of ball joints on this kit. The tom mounts of course. Then there’s the snare basket as mentioned before. 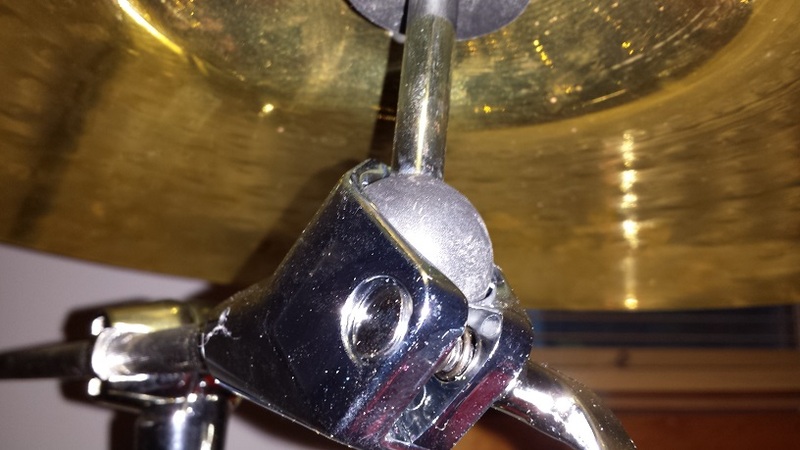 As well all the cymbal tilters are ball joints allowing for full adjustment of cymbal angles with only one screw. Some of these unusual approaches may seem like “a solution looking for a problem”. A few of them are most certainly practical though and while a couple of them may not be huge steps forward, certainly none of these innovations are steps in a negative direction. Most importantly, all mounting mechanisms, and moving parts function flawlessly and without requiring an engineering degree to operate. The multitude of ball joints are a bit stiff out of the box. This is however common on brand new ball joint mounts and should loosen up with use over time. At this stage of the Taye GoKit review I’m trying to find something negative to criticise, so as to not seem biased, but I can’t find anything in regards to Construction and Design. The GoKit gets 10/10 for Construction and Design as well. This section is largely subjective. While doing my best to describe the sound and tonal features in a matter of factly way, the sound is always a personal preference. I strongly urge listening to sound samples and if possible hearing the drums in person. Also the heads have an enormous impact on the sound of a drum kit, so while the particular tone varies with head selection, resonance, sustain and tune-ability are still qualities of the drum’s shell. The heads fitted on the GoKit from the factory are Taye’s own “Dynaton” brand. 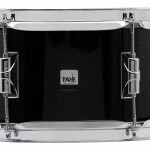 The toms and snare all have single-ply, coated batter heads and clear resonant heads that appear to be of the same gauge. 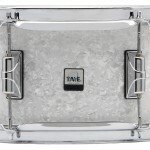 The bass drum has a clear batter side head with a muffle ring and a white resonant side head also with a muffle ring and a pre cut port hole. Judging from the sound the heads produce they would be great for Jazz, Funk and some varieties of Pop, while maybe not ideal for Classic Rock, Blues and Heavier music. Of course this is in my own, rarely humble opinion. I read another review on the Gokit on Mikedolbear.com. The reviewer states something along the lines of the toms being his favourite part of the kit. I will have to agree with this statement. The toms are just about some of the nicest and most versatile I’ve heard. Even the little 8″ sustains and sings at lower tunings like no other 8″ I’ve ever tested. 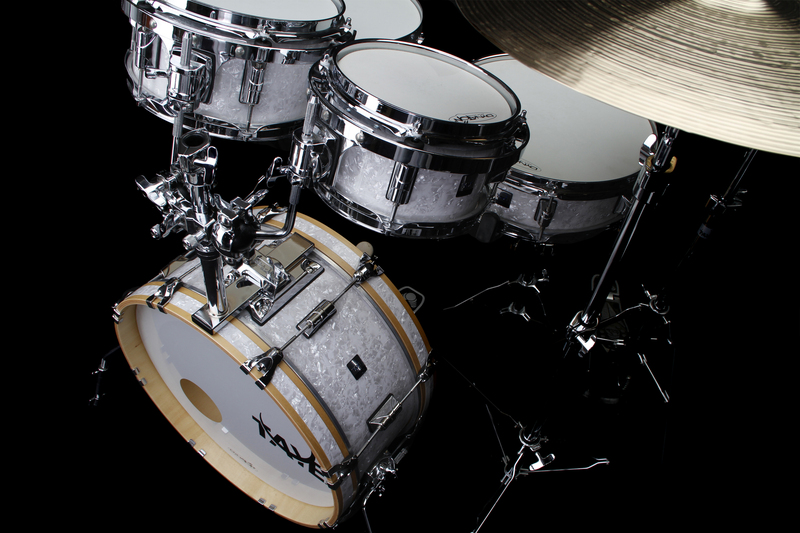 The tuning range is impressive across all three toms with a distinct tonal voice from just past floppy, all the way up to almost crushing the nylon washers. What really blows me away though is how large the relatively shallow drums sound. 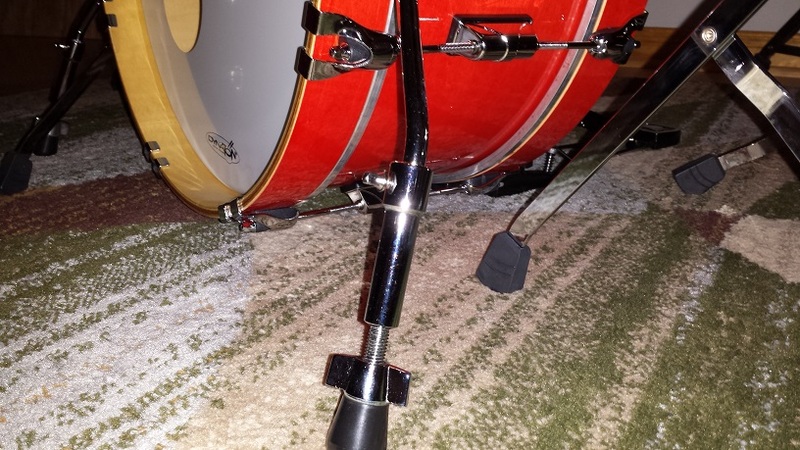 Were my eyes not telling me otherwise I would have sworn that the “floor tom” is a standard 14″ X 14″. The toms are so articulate that when purposely tuned poorly, they sing and resonate the awful tuning in a way that’s almost amusing. In a way this might even be considered a disadvantage to some. There’s no masking a sloppy tuning job, These toms will proudly proclaim to the world with brilliant clarity how clashing the relative tuning is or how mismatched the batter and rez heads are tuned. On a plus side it makes it easier to perform a proper tuning job as the tempo of the waveform is clearly audible. 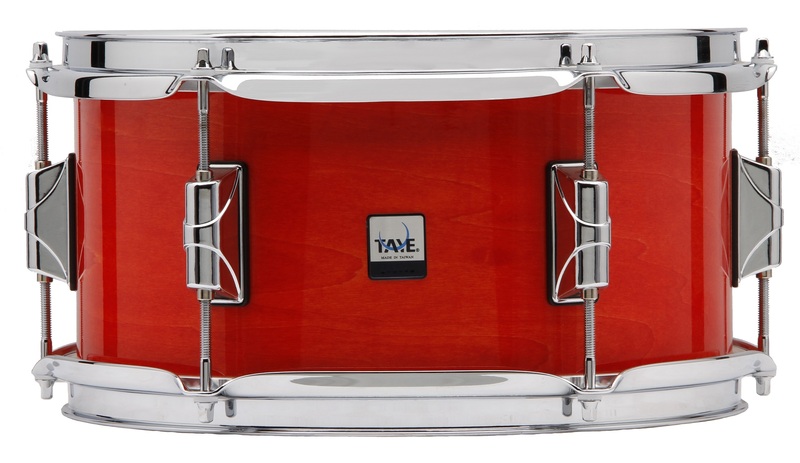 The toms raise the bar to a level that makes it hard to be fair to the snare and bass drum. 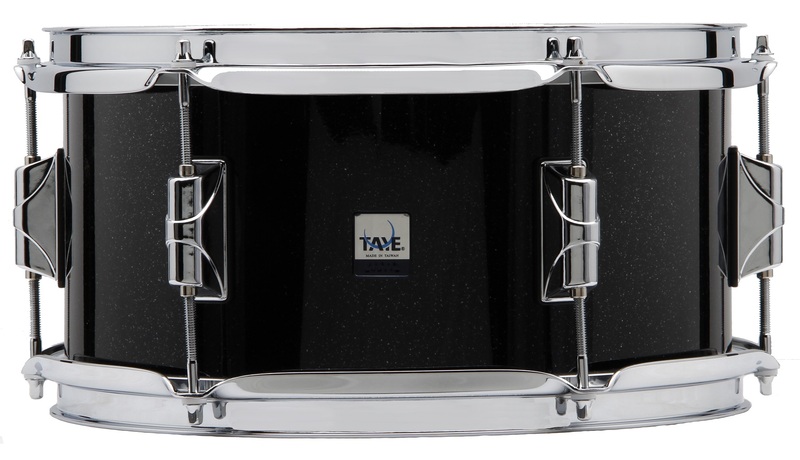 While the bass drum has a beautiful, balanced tone and an equally impressive tuning range, volume wise it’s not quite keeping up with the toms and snare. This could of course have to do with the heads, again very suited for jazz where the bass should be felt more than heard. For my own playing style though I found I had to give it some extra oomph to cut through, especially at lower tunings. Likely, a different beater and choice of heads will rectify this. The snare like the toms has sustain ’til the sun goes down and has a tuning range that begins just past floppy and goes very high, although not as high up as the toms. It does start to choke at an earlier stage, but still past what would be expected or even desired. There is no lacking in crispness or crack, on the contrary I found myself tuning it substantially lower than I would usually tune a snare to “tame” the brightness a tad. Like the toms it surprises with much louder sound than expected from the shallow size. Perhaps even a smidgeon too loud as I found myself going a little gentler on it than I would usually. 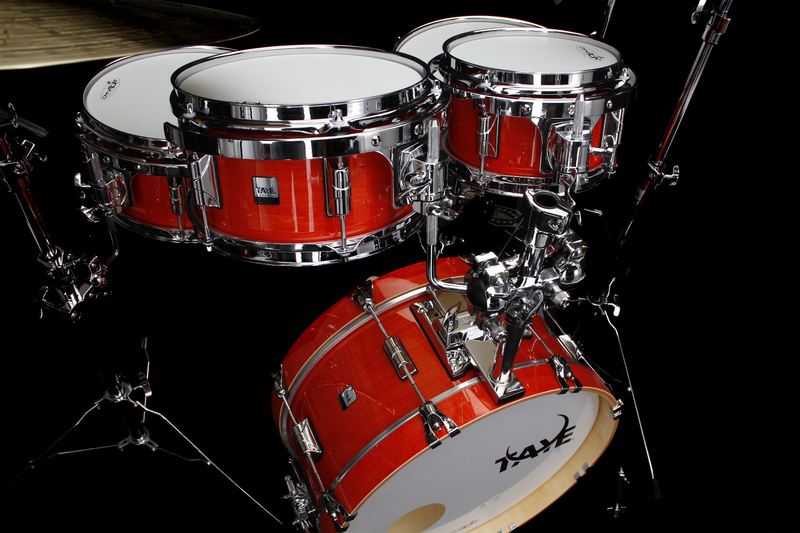 Like due to the bass drum’s lower output, which would again be resolved with different heads on the bass drum. 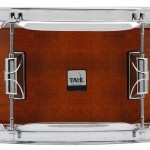 Had I reviewed the toms, snare and bass drum individually, I would have given them 10/10 throughout. 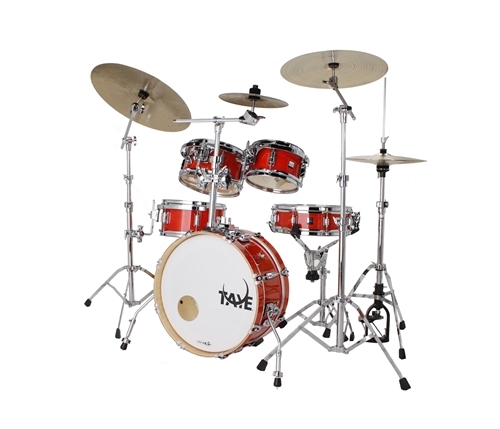 Since this is a review of the kit, and even if easily rectified due to the slight volume “mismatch” (in my own opinion), and despite that this “mismatch” might actually be a perfect match in some music genres, like jazz, I’m gonna’ hold back on the 10 and give the Taye GoKit a 9/10 for Sound, Voice and Tone. Value is another subjective topic. 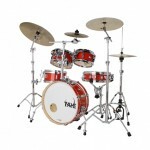 In an attempt to bring some objectiveness into the equation we’ll make a comparison with another drum kit. 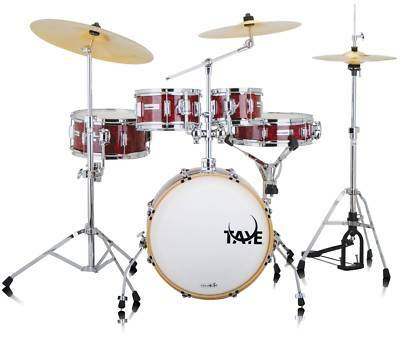 If you’ve read my review on the Pearl Rhythm Traveler, you’ll know that over the course of some 10 years or so, I’ve bought three of those kits. Obviously I’m of the opinion that these kits are good value for money. At roughly half the street price, it also makes for an easy comparison maths-wise. All we have to do is determine if the GoKit is worth 2 X the price of the rhythm Traveler. The easier part of a comparison is the objective part. Simply comparing the components and estimating their individual cost. 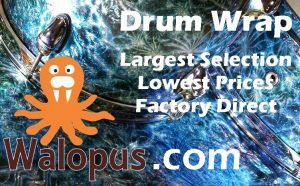 As a source for cost estimation I’ll simply use the closest match I can find at Drumfactorydirect.com. For simplicity, the items are grouped and rounded to some degree. We’ve attempted to match the level of each item with the closest product on DFD. “GoKit is designed for the professional drummer seeking high-end sound and performance in a lightweight and portable package. From small rehearsal spaces to large venues, GoKit performs well in a variety of applications, yet its scaled down dimensions make transport and set up convenient and easy every time. Utilizing a blend of Birch and Basswood, GoKit’s full-bodied tone lies in Birch’s ability to provide punchy attack and in Basswood’s inherent warm sustain. 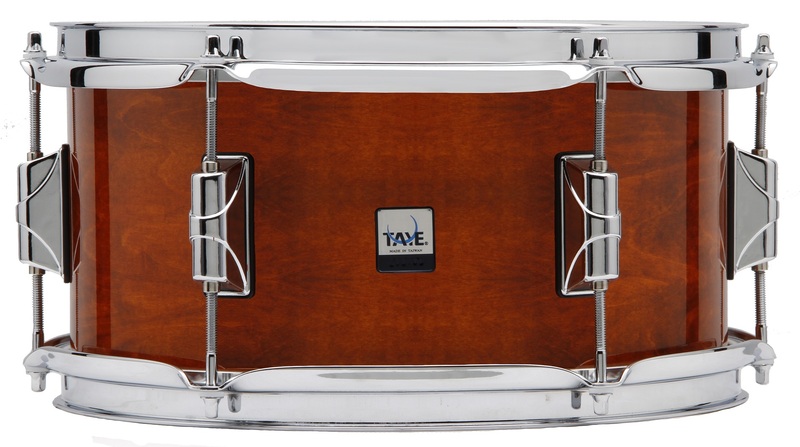 With Taye’s patented EFS Shell Technology, these two woods are cross-laminated to provide extremely rigid shells – providing enhanced projection and longer sustain. The shells are then beautifully finished in your choice of brilliant high gloss lacquers or premium laminate. 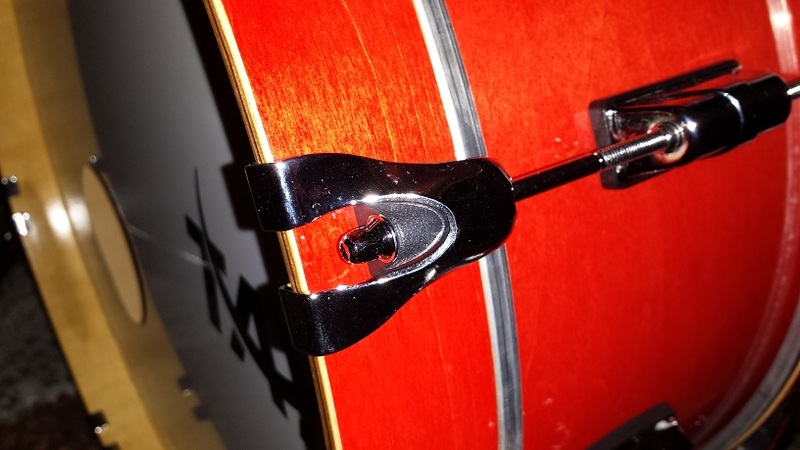 Furthermore, GoKit comes standard with many Taye patented features, including the SlideTrack Tom Holder System, which allows for the lateral placement of toms along the depth of the bass drum for ergonomic placement. The table above sums up the tangible value comparison. What’s yet to be accounted for are the cost differences between Taye’s lacquered birch/Basswood shells and Pearl’s wrapped lauan shells. However even with just the tangibles it’s plain to see that the roughly 2 X pricetag of the GoKit is a more than fair reflection of the value. The Taye GoKit gets a 9/10 for value. Typically when I’m reviewing a drum kit I’m looking extra hard for positive aspects to praise so as to not be too harsh. This review has been an exercise in the opposite. I’ve had to look hard to find any negative aspects of the GoKit to criticise, so as to not seem biased. Having thoroughly examined the kit, I’m of the opinion that it’s priced on the low side, more so because the market for small size drum kits likely won’t bare a higher price-tag, than a reflection of the actual value. I would highly recommend the GoKit for anybody looking for a compact, portable drum kit beyond entry level. 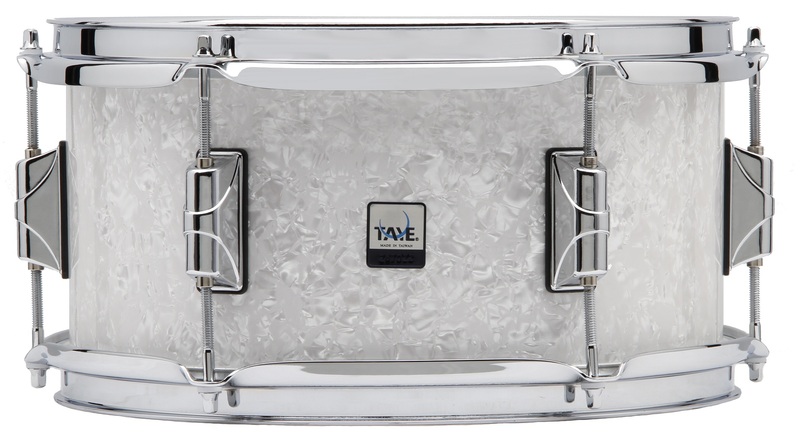 This reviewer is looking forward to a long and enjoyable relationship with the Taye GoKit. 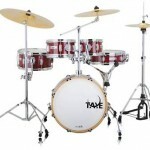 Without any reservations, CompactDrums.com awards our first ever 5-star rating to a drum kit.